Well, my week of vacation is slowly but surely coming to an end. I didn’t mean to also pretty much take a vacation from blogging, but I was so busy that it just sort of happened. Sunday through Wednesday Bookman was home with me and we worked hard in the garden. The weather was dry and partly cloudy to sunny, not humid and not too hot. We did work up a sweat though! One of the first things we did was get some stakes and bird netting to try and protect Boo the blueberry from birds and squirrels. The berries aren’t ripe yet and probably won’t be for another month or so, but we didn’t want to wait. We will see if the netting keeps the critters at bay. Fingers crossed! There was also lots of weeding to do, there always is it seems even when things are mulched. And I sent Bookman on lots of runs to the park to pick up buckets full of wood chips. 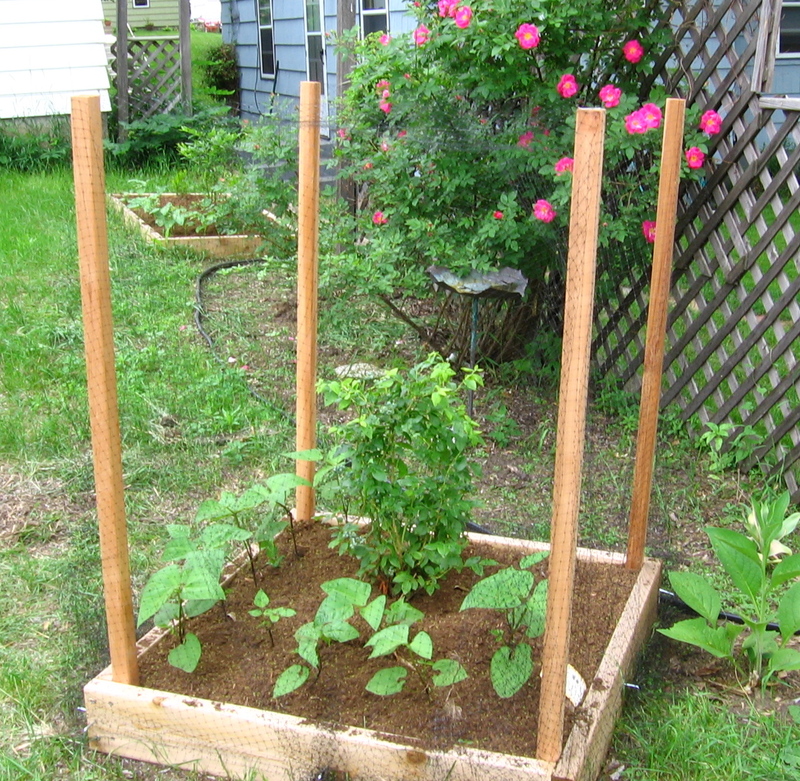 Free wood chips are a gardener’s dream and we take advantage of the gift from the city. Well, I suppose my taxes pay for it and it is cheaper to let gardeners take the wood chips than it is for the city to create giant compost piles. The chips come from city tree trimming and they leave huge piles of them in various parks around town. One of the things we are using the wood chips for is the latest big garden project. There is a concrete path running down the middle of the back yard that then curves around to the side of the house and the back door. Our yard slopes away from the house, which is good, but the concrete walk always turns into a small stream when it pours rain. This has always annoyed me, all that wasted water running out of the garden and into the alley behind the house. Plus, a deck was installed off the kitchen at the back of the house not long before we moved in and the path doesn’t go up to it. For years we’ve been stepping down into grass and then stepping over to the path. This has also annoyed me. The concrete of the path started crumbling a couple years ago and by the end of last summer it had become so pitted and ugly that I was determined to get rid of it. So, with crowbar and sledge hammer, Bookman lifted up a slab closest to the gate two weeks ago so we could see what was what. for the new path goes over the old path for a short distance. It’s not ideal, but Bookman, who is the muscle in this operation, did not relish the thought of removing two concrete paths. So this week we started at the back gate, breaking up the old path. The first slab Bookman lifted up those couple weeks ago turned out to be the easy one. All the others, it seems, are concreted together between the buried path and the one we are taking out. Poor Bookman has to take out both paths anyway since they are stuck together. We got from the gate to just before the clothesline pole. While Bookman rested, I got to work with a spade cutting the edges of where the new path should go. 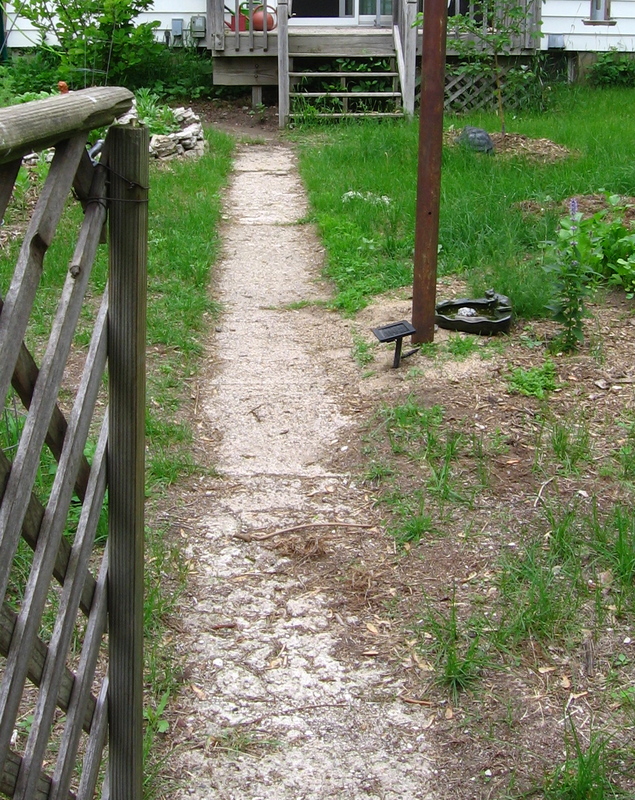 It is a little wider than the old path and wider at the gate before narrowing a little into the garden. Then down went buckets of wood chips. And then, because we are awesome at recycling, we started breaking up the concrete from the path First we made stepping stone-sized pieces, turned them over to their smooth bottom sides, and wiggled them into the wood chips. Then, we broke up smaller pieces and started using them to edge the path. And then we were exhausted. But it is already looking nice, don’t you think? We will keep working away at it now on weekends through the summer. Flowering this week is chamomile which got flattened by a torrential downpour that included hail before I could take a decent photo of it. The plant will be fine it just is sprawled out over the ground instead of upright. The peas in the veggie garden began blooming. Yay peas! The catmint is blooming too. 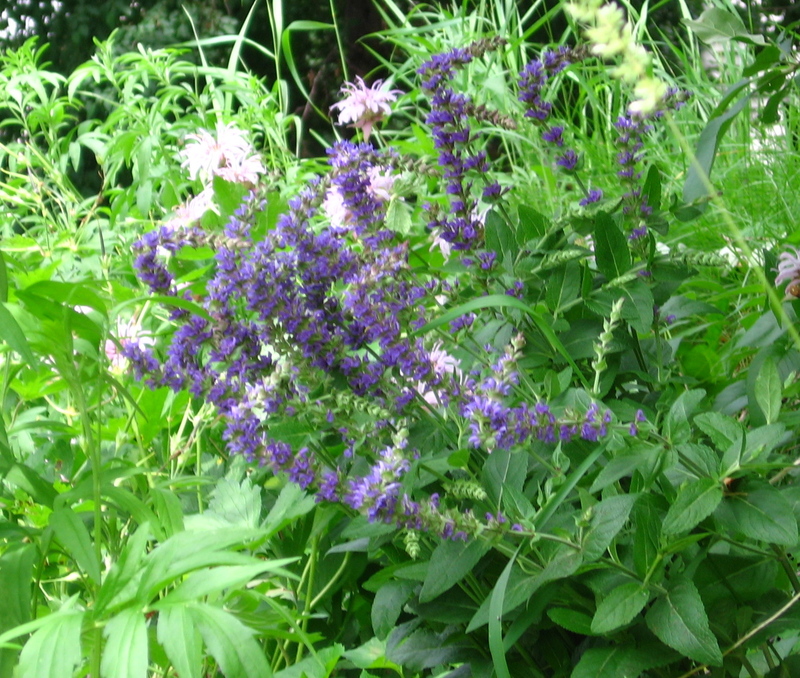 Catmint not to be mistaken with catnip. 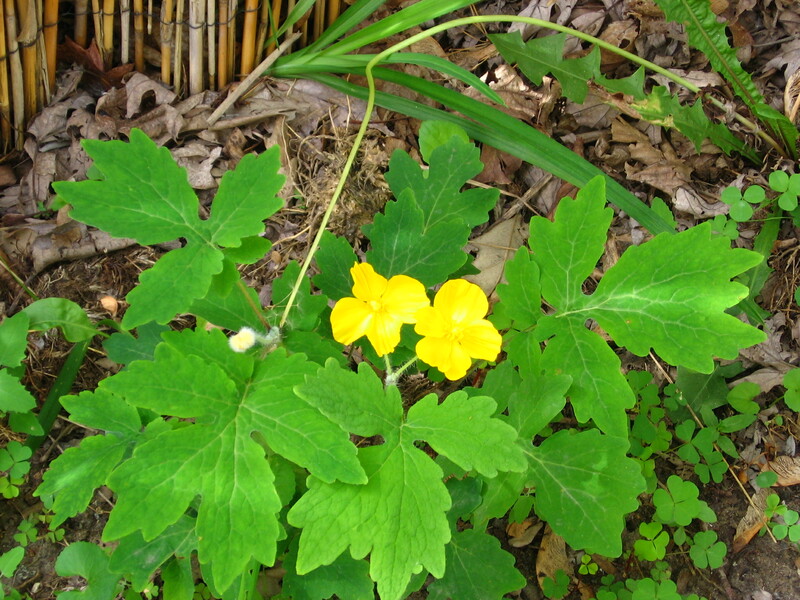 Two different plants. In the photo you also get to see Rex, the garden gargoyle. Rex used to be the library gargoyle. He sat outside our basement library door enjoying a sheltered in-house existence for many years. Then we ripped out the dingy carpet and put in clean, cool ceramic tile. Rex was okay with that until he met with a wayward foot and tumbled over onto a wing which promptly shattered. We had thought to superglue the wing back on but it was in too many pieces. So Rex was set out in the garden instead beneath Clifford the big red dogwood in a lovely patch of catmint that grows up and hides the evidence of his missing appendage. He’s been out there for about five years now and seems to enjoy it. wouldn’t look as tidy as it does. 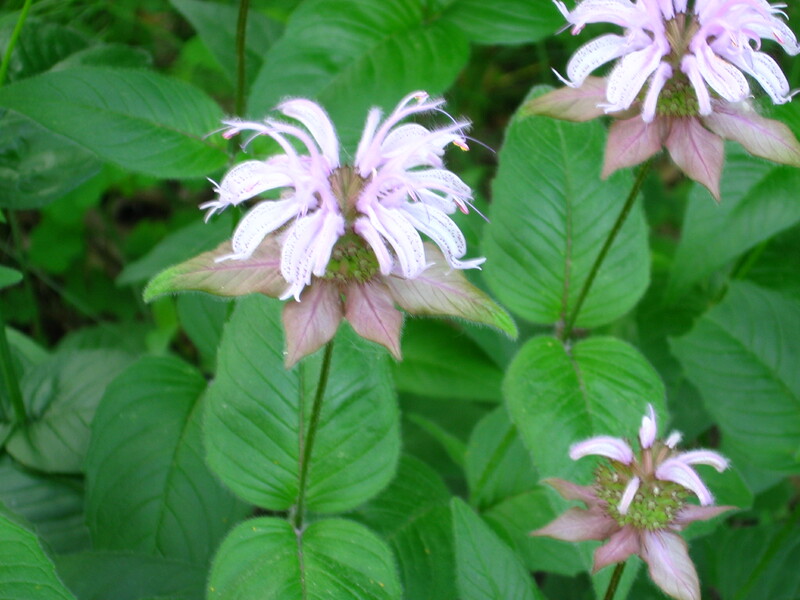 There is also bee balm and delicate harebells and a goats beard I have had for ten years that just keeps on going in spite of me pretty much neglecting it except to cut it back at the end of the season. I ordered fall bulbs this past week, but this post is already getting too long so I will save that for next weekend. I finished three books while on my vacation and bought a couple new ones today. Lots of bookish stuff ahead this week! Cipriano, Poor Robert Plant! I have no indoor plants because Waldo and Dickens pay them too much attention. All my green has to remain outdoors. Hopefully Kennedy loses interest in Robert soon! Oh, I love the new path! The end result will bring you and Bookman pleasure for years to come. I liked Rex’s story. He does look comfortable. I’m sorry your vacation is drawing to a close. It looked to be a most enjoyable one. Vanessa, thanks! We’ll have to put down more wood chips every year or two, but I don’t mind. Glad you enjoyed Rex’s story. And yes, it was a most enjoyable vacation. Beautiful photos! I like stay-home vacations, too, but sometimes they’re a lot of work! Love the look of the new path! Sorry your vacation is coming to an end, that is always a melancholy time. Hope the time to the next vacation isn’t too long. Carl, thanks! The next vacation is always too far away! But I have July 4th to look forward and another few days off at the end of July. Better than nothing! I like the way you are recycling the concrete. The new path looks much more garden like than the old – a garden should have an organic look if at all possible, right? Before you know it, it will be completed. I have two baby eggplants growing and so far nothing has eaten my pear tomatoes. The zucchini plant has two big flowers, so I expect I’ll have some zukes soon. Who knows, maybe they’ll all be ready for harvest at the same time and I can make a very small batch of ratatouille. Do you think I can grow goats beard in coastal Ga? I’ll have to check it out. My backyard is all shade, practically, and looking pretty dismal. Love the pictures! Grad, thanks! The recycling is mostly because we are cheap. The city only allows one drop off of concrete waste a year and it has to be dropped off at a designated location. Since we don’t have a truck and don’t want to pay to have the concrete hauled away, we got creative 🙂 I do like a more organic look to a garden path and since my garden is not formal it doesn’t need brick or fancy slate. Your vegetables are progressing nicely. I have a flower on one of my anemic looking tomato plants. The cool wet spring was not kind to the poor thing. 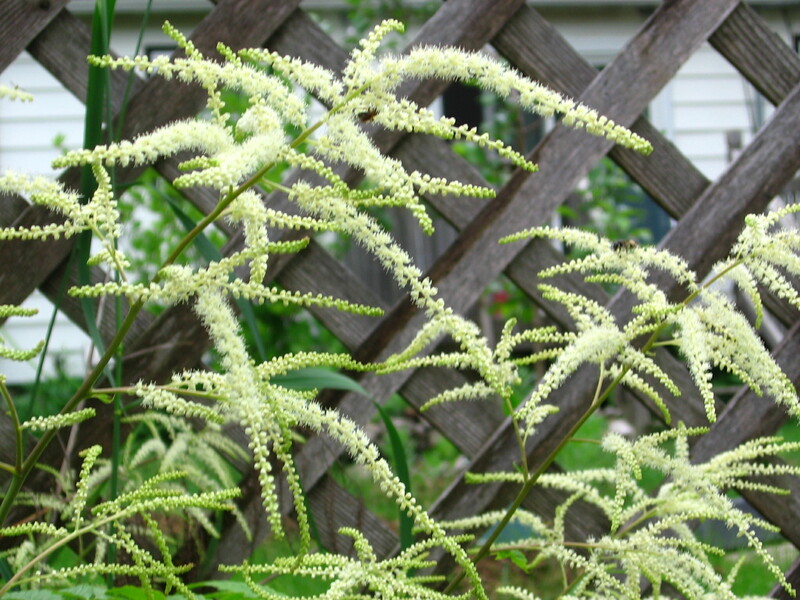 Goat’s beard is good for zones 4-7 but I bet you could do zone 8 if it gets mostly shade and only morning sun. Sounds like you accomplished quite a lot on your vacation–I sort of like no posting while I am taking that sort of a break as then I really can concentrate on other things and not sit in front of the computer all the time–and now you’ll have lots to share this week! 🙂 You’ll have to take a photo of your garden in its entirety (or can you get a photo with it all squeezed in?) so we can see what all the parts look like together. 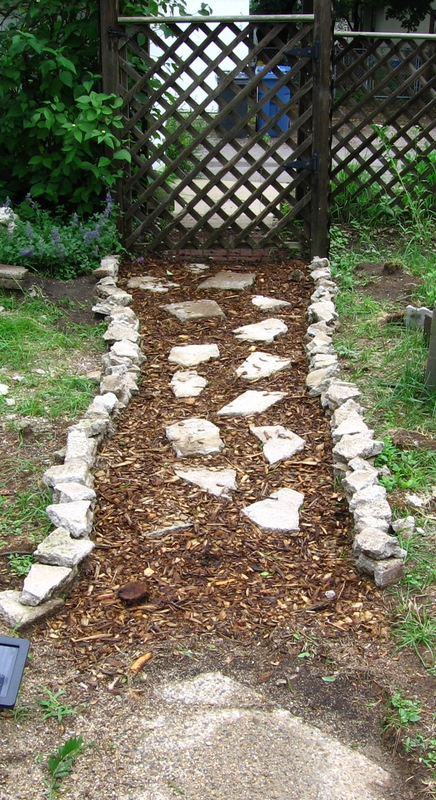 I love the recycled path, too–what a good idea and it looks so much nicer than before. 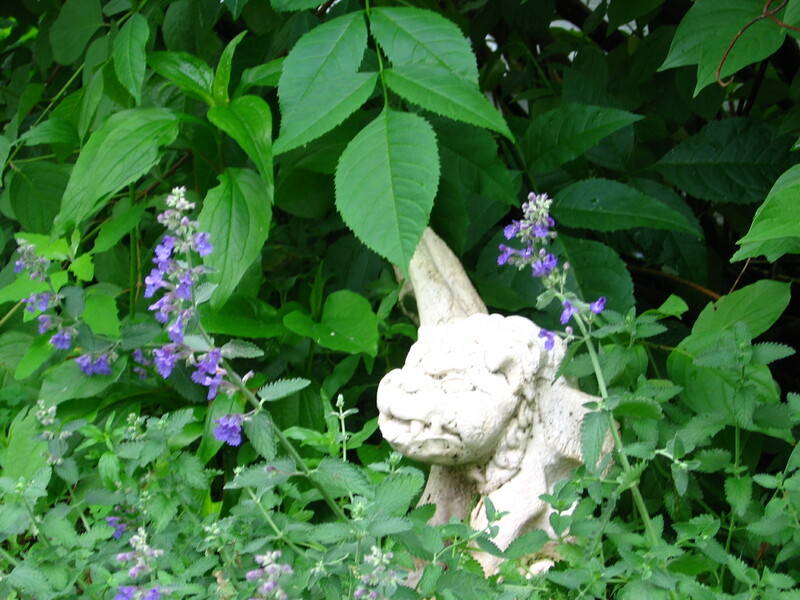 And your gardn gargoyle looks very happy there amongst the greenery! Glad the weather cooperated and now there will be the 4th of July holiday to look forward to! Danielle, i did but of course all I can think about are the things I didn’t get to! I’ll see if I can’t get some bigger photos, maybe towards the end of the summer when, I hope, the garden path will be finished. Glad you like it the path. I do Rex the garden gargoyle. I don’t have many decorations in the garden so he stands out. Thank goodness for 4th of July! Looking forward to it!